Hardnecks: Asiatic, Turban, Creole, Rocambole, Porcelain, Purple Stripe, Marbled Purple Stripe, and Glazed Purple Stripe. Garlic has been cultivated for thousands of years but there’s surprisingly little scientific research into many varieties so classification is often a matter of guesstimation and convenience as opposed to a matter of hard science. Only DNA analysis can prove if a variety is actually unique; some garlic has been passed from grower to grower and later renamed, so some “varieties” and types of garlic with unique names are quite likely actually genetically identical. The converse is also true, as DNA analysis has turned conventional wisdom on its head in some cases, such as the discovery that asiatics and turbans are genetically different from artichoke garlics — and that asiatic and turban garlics are genetically different from one another as well. Below are descriptions of the major groups of garlic along with some general characteristics. Please keep in mind that this is meant to be a general, practical guide and is a work in progress as new research and information is discovered. 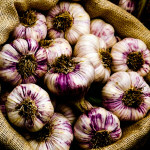 Asiatic: Asiatic garlic varieties are among the earliest harvesting garlics and mature similar to onions — getting big and maturing very quickly. They tend to have 8-12 big cloves per bulb and don’t store for long, usually no more than 4-5 months before they begin to sprout and want to get into the ground. The fact that they can be harvested in spring plus their relatively short storage time makes them a popular choice for garlic growers looking to stagger their harvest times and have fresh garlic available for as much of the year as possible. Taste of Asiatics will depend depend on the variety but they tend towards the strong and hot end of the spectrum, especially when eaten raw. Popular Asiatic garlic varieties include Pyong Vang, Asian Tempest, Sonoran, Korean Red, Russian Red, and Asian Rose. Turban: Turban garlic is very similar to Asiatic and it is also one of the earliest harvesting garlics. They have very large cloves and fewer cloves — usually five to eight per bulb — than Asiatics do. They’re short storing garlics and need to be watched closely when they mature in spring, as they’ll lose their bulb wrappers if left in the ground too long which cuts their storage time down even further. Turbans, Asiatics, and Creoles show characteristics of both hardneck and softneck garlics and are all three weakly bolting garlic varieties — they don’t always form scapes/flowers. Turban and Asiatics were long considered to be essentially the same types of garlic but research has shown that they are genetically different. Turbans are one of the earliest-maturing types of garlics and grow well in warmer climates as compared to Porcelains and Rocamboles. Popular Turban varieties include Red Janice, China Dawn, Shandong, and Tzan. Creole: Creole garlics share many traits with Asiatics and Turbans and are some of the prettier garlics as far as appearance and striking colors. Creole garlics typically have 8-12 cloves per bulb and are one of the better-suited garlics for growing in warmer U.S. states, as many other garlics struggle in areas with warmer winters and early, hot summers. They’re very tolerant of droughts and tough growing conditions – although they do tend to be on the small size as far as bulbs. These garlics originated in Spain and came to North America via Spanish conquistadors making their way through the Caribbean — thus the Creole name. Since many Creole varieties grow well in southern U.S. states the assumption is often that they get their name from being grown in Louisiana but that’s not the case at all. They store very well — similar to Artichokes and Silverskins — and the bold visual appearance of many Creole types of garlic make them great sellers in farmers markets. 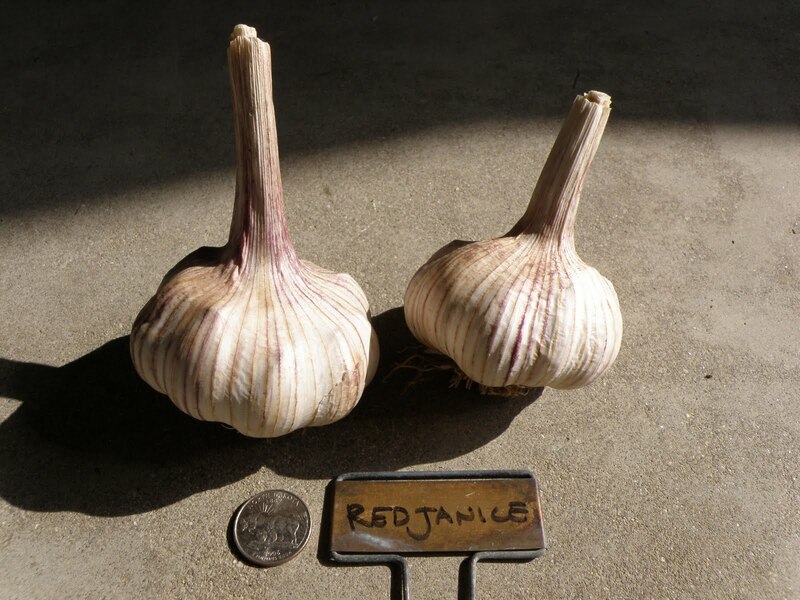 Popular Creole garlic varieties include Creole Red, Ajo Rojo, Burgundy, Pescadero Red, and Rose de Lautrec. Rocambole: Rocambole garlics aren’t the prettiest garlic around when it comes to visual appearance but they more than make up for it with their flavor, as they’re a favorite of chefs due to their rich, complex taste. They typically have 7-9 cloves per bulb and their scapes will form a double loop — the only garlic with scapes that do so. 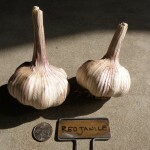 Rocamboles struggles in areas with warmer winters and hot summers and they’re one of the shortest storing types of garlic, usually only storing for about four to five months. Popular Rocambole garlics are Amish, German Giant, German Red, Spanish Roja, and Ukraine Red. Porcelain: Porcelain garlics are one of the most popular gourmet garlics and are also some of the prettiest as far as physical appearance. They are generally very robust as far as flavor and include some of the hotter and spicier varieties available. They are one of the longer-storing garlics and are very high in allicin — the primary ingredient in garlic that has been linked to numerous health benefits. Porcelains tend to be very large and only have around 4-6 cloves per bulb. They tend to mature later in the season than other varieties except for Silverskins. Like Rocamboles, they fare best in colder climates and are the garlic of choice to grow in many northern U.S. states and Canada. Popular Porcelain types of garlic include Majestic, Music, Georgian Crystal, and Romanian Red. Purple Stripe: Classifying Purple Stripe garlics can be a little hard, as some lump them all together while others keep Marbled Purple Stripes and Glazed Purple Stripes separate. True to their names, Purple Stripes are often very vividly striped and colored. They’re also some of the tastier garlics — especially when baked — and often used by chefs, making them a very popular choice. Genetic analysis has shown Purple Stripes to very likely be the original line of garlic that other varieties developed from. 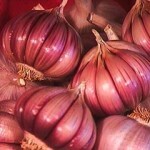 Popular standard Purple Stripe garlics include Chesnok Red, Persian Star, and Belarus. Marbled Purple Stripe: Marbled Purple Stripes tend to have darker colors than standard ones and usually fewer cloves and a hotter taste. Glazed Purple Stripe: Glazed Purple Stripes have bulb wrappers that look almost glossy, with the standard bold flavor of all Purple Stripes. Artichoke: Artichoke garlics are softneck garlics that get their name from the way their cloves are arranged, as they have several overlapping layers of cloves that looks like an artichoke. Artichoke garlics thrive in a wide range of climates and tend to be large, long-storing garlics. The fact that they’re a softneck garlic means that they can be braided, with artichoke garlics commonly sold in grocery stores as well as at farmer’s markets. The vast majority of garlic sold at grocery stores and retail locations in the U.S. are artichoke garlic, much of it grown in California and imported from China and other countries. Popular Artichoke garlics include Italian Late, Kettle River Giant, Inchelium Red, Red Toch, Polish White, and Thermadrone. Silverskin: Silverskin garlics are typically the last to mature each season and are softnecks similar to artichokes and can be braided. Silverskins are some of the best-storing garlics, which coupled with their late maturation means they may be your best bet when growing garlic to have available year-round as silverskin bulbs can often last and stay good well into the next spring after harvest. 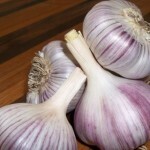 Popular Silverskin garlics include Baja Morado, Nootka Rose, Rose du Var, and Mount St. Helens.